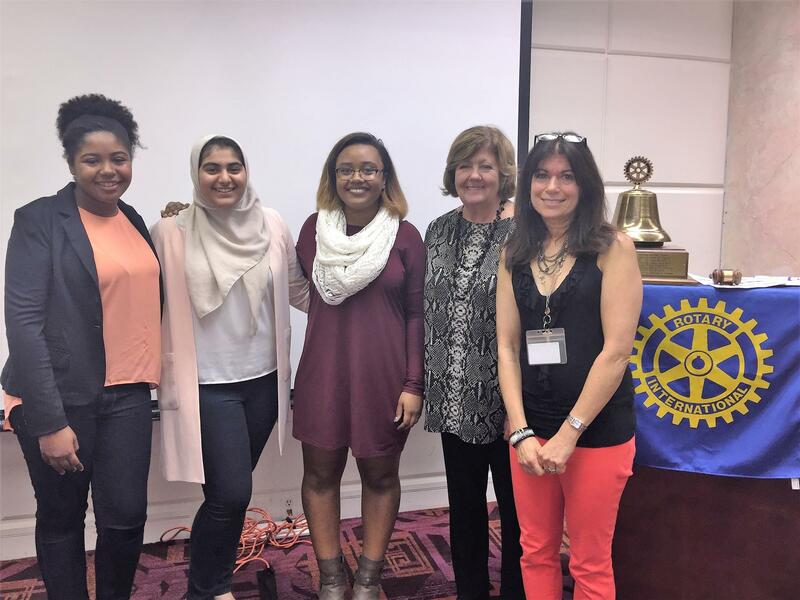 Judy Aronson and 3 students; Alexis, Kaya, and Eiman joined us today to speak about the John Grieco Scholarship Fund. Molly Berry, Eddie Hadden's neighbor; Judy Aronson of John Grieco Scholarship Fund, guest speaker. This month, the last Tuesday of the month get-together will be celebrated as Oktoberfest. (Oct 25, 6:00, Crowne Plaza) $50 per person. No lunch meeting. Oktoberfest at the Community Chest will be held on Oct 19, 6:30-9:30 at the Englewood Field Club—$99.00 per person. Our fundraiser on November 20 will be held at Joe and Judy Klyde's home--$100 per person. Time: 5:00 to 7:00. Halloween Against Hunger is on Oct 22. Looking for each club to donate $150. 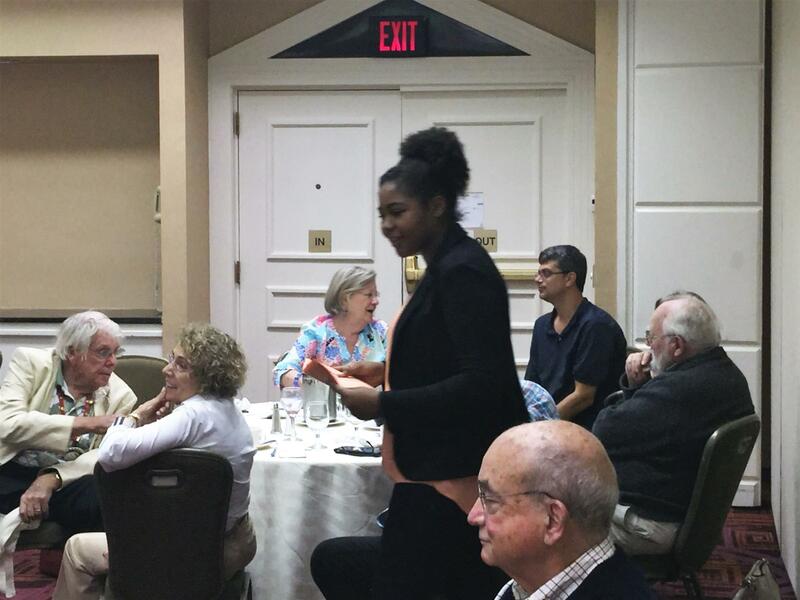 The Rotary Leadership Institute will meet in Montvale NJ on Oct 29. UN Day will be November 12. The Rotary Foundation Fundraiser is on November 15 at Seasons --$75 per person. The Annual Thanksgiving Intra-Club lunch will again be at the Clinton Inn on Tuesday, Nov 25; $25 per person. 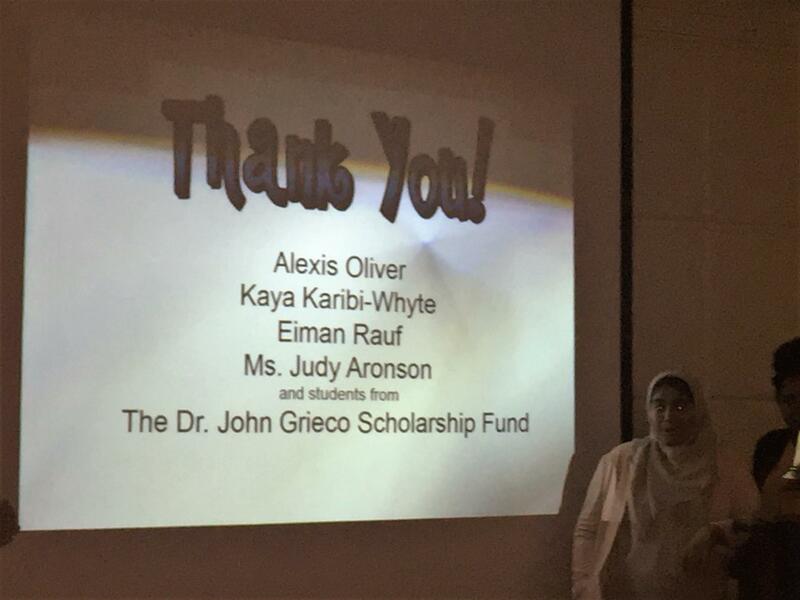 Judy Aronson, along with her three very poised junior students, Alexis, Kaya, and Eiman, spoke about the John Grieco Scholarship Fund. The scholarship, run by Judy, is a non-profit charity. It was founded in 2004 after the untimely death of Englewood superintendent of Schools, Dr. John Gierco, as a tribute to him. He was the founder of the Acadmies in Englewood and a beloved figure in the school system. The fund is organized and run as an academic class for students at Dwight Morrow HS and the Academies. The goal of the scholarhsip fund is to raise money each year and give out $22,000 in scholarships to deserving students. A male and female student from each school and in each grade from 7th on to seniors is chosen as winner through an application process which includes essays and GPA scores. 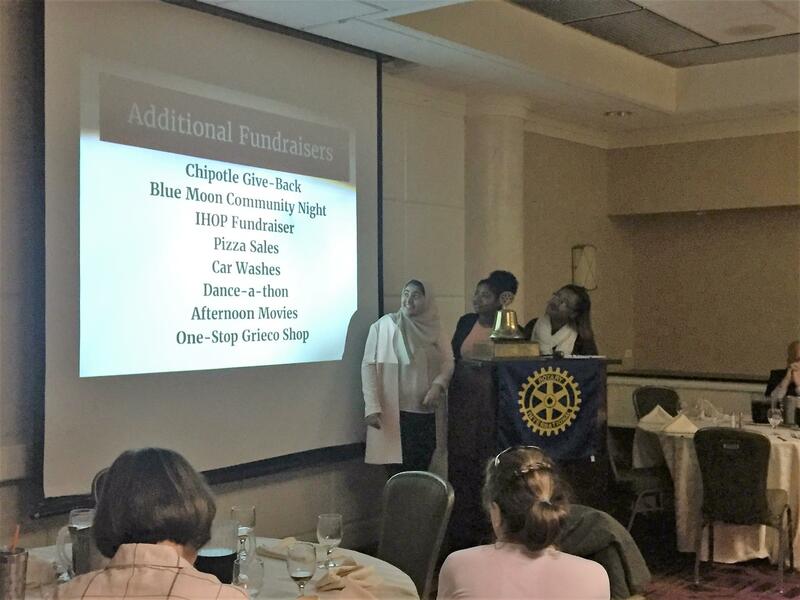 Funds are raised by student fundraisers through Englewood Idol, car washes, 12-hour dance -a-thons, hot dog sales, and snack sales from Judy's office. 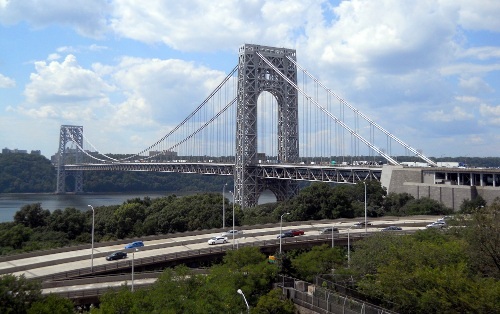 A matching grant comes from the Community Chest serving Englewood, Tenafly and Englewood Cliffs. Additional fundraisers include Chipolte Give Back, Blue Moon Community Night, and I Hop Fundraiser. When in college, students use their winnings to pay for tuition, meal plans, textbooks, laptops, and tutoring. Community Philanthropy: The student fundraisers are now busy raising money for the disaster in Haiti. A student can choose a favorite song to be played in the cafeteria for a dollar. Another campaign concerns the purchase of an elecronic marquee for the Dwight Morrow campus. The students have already raised $6,000—they need $32,000. Having met three of Judy's resourseful students, we can be confident that they and their peers will find a way to raise the necessary funds for this project. 50/50 no money in the pot!